Of all the potential consequences of debt, defaulting on a mortgage and losing your home may be the most frightening. The media treats the foreclosure crisis that began in 2008 as a thing of the past. But ask any mortgage lawyer who has helped a family fight to keep their house, or any homeowner staring at a mailbox full of collection notices, and they’ll tell you: the crisis never truly ended, and another one could be on the horizon. The predatory lending that led to the collapse of the housing market—and disproportionately targeted minorities—slowed under increased scrutiny in the years following the crash. But the loans issued during that time are still impacting homeowners today, and people are still affected by the “robo-signing” practices that came to light in 2010. And in today’s lax regulatory environment, lenders are finding new ways to push borrowers into loans they can’t afford. It’s critical to understand the realities of mortgage debt and what steps you can take if it gets out of control. Of the $13.15 trillion in total U.S. consumer debt outstanding in December 2017, $8.88 trillion (over 67%) was mortgage debt. The national average mortgage debt in 2017 was $201,811 a 9.5% increase from 2007. On average, one out of every 248 households in America received a foreclosure notice in the third quarter of 2012. 10 million American families owed more on their mortgages than their homes were worth in 2014. Over 9.3 million homeowners lost their homes between 2006 and 2014. 70% of the mortgages that entered foreclosure in 2016 were issued before 2009, despite only making up 30% of the mortgage market. About 30% of black and Hispanic borrowers’ homes in total have gone into foreclosure in the years since the housing market crash, compared with 11% of white borrowers’. Click here to read more startling facts about mortgage debt. There’s no question that the housing market has improved dramatically from where it was 10 years ago. By the end of 2017, 4.4 million homeowners were underwater on their mortgages, down from 10 million 4 years earlier, which is great news—unless you’re one of the 4.4 million. For most American homeowners, their home is their greatest financial asset. For decades, it has been common practice for middle class homeowners to refinance or take out home equity loans to meet other financial goals and come up with cash in emergencies. As long as home prices rose at a reasonable rate, homeowners had every expectation they could still pay off their mortgage before retirement. And when prices rose over 60% between 2000 and 2006, many homeowners borrowed more aggressively than ever. But when the housing market crashed, it sent home values plummeting. 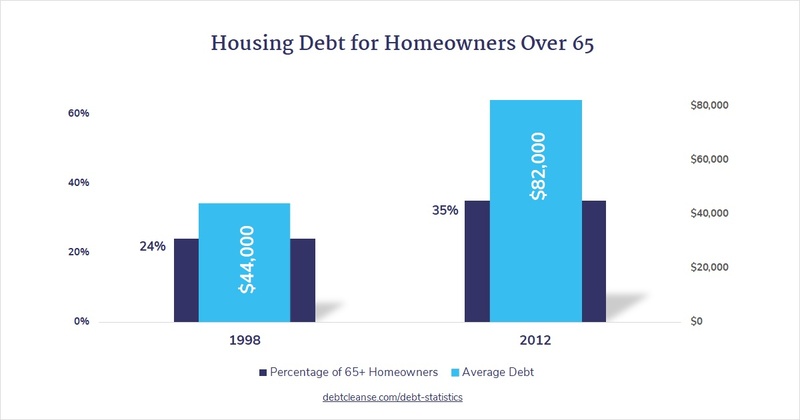 As a direct result, the number of people at or nearing retirement age who are still paying off housing debt rose sharply, as did the amount they owe, according to two studies by the Center for Retirement Research at Boston College and the Urban Institute. Click here to learn more about clearing unaffordable debt for pennies on the dollar. The predatory lending practices of the 1990s and early 2000s that led to the Great Recession disproportionately targeted minorities, particularly black and Hispanic buyers living in segregated communities that were historically underserved by major lenders. The banking software company ComplianceTech found that over 50% of black buyers and 41% of Hispanic buyers received subprime loans in 2006, compared to just 22% of white buyers. This held true even for minority buyers whose credit histories made them perfectly qualified for prime mortgages. Not only were minority communities hit hardest by the foreclosure crisis, they have also been far slower to recover, in large part due to the banks’ treatment of foreclosed properties in those areas. In 2016, the National Fair Housing Alliance filed a federal lawsuit against Fannie Mae demonstrating that Fannie, and other large lenders, properly maintained foreclosed properties in white neighborhoods so they could resell quickly, while allowing those in black and Hispanic neighborhoods to fall into disrepair, causing them to remain vacant. This discrepancy slowed the growth of home values in minority neighborhoods, making it harder for those homeowners who are still hanging on to get their heads above water. The subprime mortgage crisis happened because unscrupulous lenders pushed people into taking out mortgages they couldn’t possibly afford. Now, some lenders may be trying to do it again, albeit with different packaging. In a December, 2017 article for Forbes, DebtCleanse founder and CEO Jorge Newbery wrote about multiple lenders starting to offer mortgage programs targeted at “low-income and moderate-income” borrowers that would essentially cover their down payment and closing costs, or simply gift them a small percentage of the home’s purchase price. But the fine print states that these “gifts” are considered taxable income. So the new homeowners who enter into these programs could find themselves hit with an unexpectedly massive tax bill on top of their new mortgage payments. Although Newbery acknowledged that while some lenders are well-intentioned and just want to help people become homeowners, he cautioned that others only see dollar signs. After a series of tragedies, Jorge Newbery almost lost everything he had to mortgage debt. But he found a way to fight back, pay off his debts for pennies on the dollar, and take control of his financial future again. He founded DebtCleanse to help others do the same. Click here to download a free chapter from his book and learn how you can use his strategies yourself. If you’re dodging collectors and are worried that one more missed mortgage payment could mean losing your home, there are steps you can take to break the cycle before it’s too late. Looking for more assistance? These steps have been built into the DebtCleanse Premium online platform, including a DebtTracker and Letter Generator to stay organized and push back against creditors. Premium members also have access to a network of affordable attorneys motivated to help. Free members can access to the DebtTracker and will be able to upgrade to a full membership at any time. Don’t live under the shadow of your debt a second longer than you need to. Click here to find your debt solution. Reach out to us to learn more about clearing your mortgage debt for pennies on the dollar. Fill out the form below or call 800-500-0908 and one of our support experts will be happy to help you. Stuck in a cycle of never-ending debt payments? DebtCleanse can help you take back control of your payments and your life.